Many public service entities adopt a system where agreed targets and objectives are developed between individuals and their immediate supervisors to produce an individual work plan. The public service hierarchy and command and control style of administration support this type of system. Although it provides an opportunity for performance related discussions, it does not try to approach operational performance in a holistic manner (PAHRO, 2015b). Also, performance evaluations may serve to demotivate staff due to the lack of consistency across the public service (Bonnici, 2010). The following brief overview of the Maltese public service administration is necessary since this study seeks to test the theory within the local context. The Public Administration Act (Ministry for Justice, Culture and Local Government, 2010) values the efficient delivery of services to the public, while at the same time caters for the successful implementation of policies. 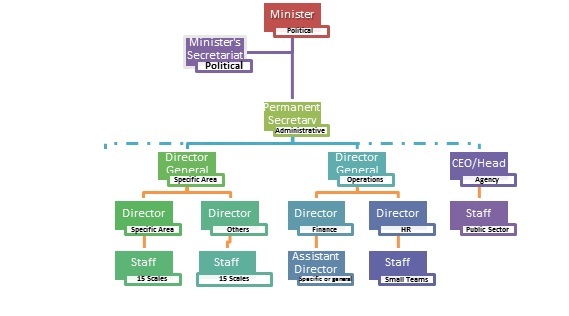 An overview of a typical hierarchy of a Ministry is depicted in figure 1.1. Such structures are subject to change given that this project is being submitted on the eve of a general election. The Public Administration HR Office aims to ‘develop and promote in close collaboration with line Ministries, progressive human resource policies, strategies and management systems in support of the business of Government’ and ‘to render an efficient service to the public’ according to its mission statement (PAHRO, 2015a). Rigby et al. describe the fundamentals of Agile management with respect to Agile Scrum (refer to section 2.1.1). 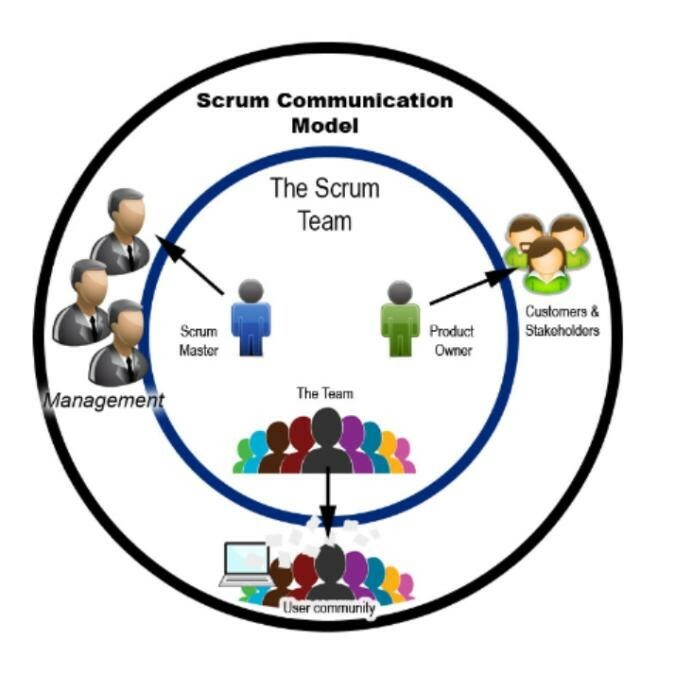 Scrum is one derivative of the Agile methodology and it is employed at least five times as often as the other derivatives. The organization or institution creates and empowers small teams, usually not more than ten people, associated to a specific goal such as, a project, a service or an operation. Preferably, teams are multidisciplinary and include all the skills required to complete their jobs. They must manage themselves and are strictly responsible for every aspect of their work. A team’s ‘Objectives owner’ (also known as a product/service owner) is ultimately responsible for delivering value to end users (including internal and external customers) and to the business. The owner doesn’t tell the team who should do what or how long tasks or jobs should take. Rather, the team plans its activities and breaks the highest-ranked tasks into small jobs. It decides how much work the team can accomplish in short cycles (can be a week, number of days or weeks but less than a month) known as sprints. A facilitator (often a trained Scrum Master or team leader) guides the process. The facilitator protects the team from distractions and helps solve obstacles beyond the team’s reach. The process is transparent to everyone and teams should hold daily short meetings (15 to 30 minutes) to review progress and identify obstacles (Rigby, Sutherland and Takeuchi, 2016). In view of the contrasting and innovative approach to public administration this research aims to study, a qualitative approach is deemed more appropriate. Data about a proposed Agile system is obtained via semi-structured interviews. The target population is one Ministry and with its vast range of activities it encapsulates a good representation of public service operations. The Ministry is divided into five main sections namely, Administration, Operations, Internal and External Services, and Specific Functions. A number of informative cases with at least five years public service experience is selected from each group (figure 1.3). This provides an illustrative profile that is considered representative, albeit not statistically (Neuman, 2005). The use of semi-structured interviews as opposed to questionnaires facilitated the explanation of an Agile scenario before collecting responses. The general ethical principle is to ensure confidentiality and anonymity of participating individuals and entities. Participant’s consent is given freely and based on full information about participation rights and use of data. Furthermore, access to public service entities has been formally approved by the Ministry’s Permanent Secretary (Appendix C). What is the status of today’s operational context in relation to Agile concepts? That is; how objectives and tasks are defined, prioritized, and reviewed? How are problems handled? Are there standard operating practices? Do employees work in teams and meet on regular basis? What is the impact of Agile concepts on the public service context? That is; how do participants envisage the new approach in terms of the bigger picture, to the new team structures, regular meetings, obstacles handling, and new Agile roles? What are the main advantages and disadvantages? The project is organized in six chapters. This introductory chapter provided the context, the Public Service against which Agile will be proposed. A second chapter reviews the theory of Agile concepts and methods, and the various implementations. To set this study within a wider context this chapter includes a review of the work that has already been done on this topic, including Agile implementations within the public service. Judgements on operational problems and issues the methodology tries to solve are identified and presented as evidence, however, these are complimented with personal observations. Chapter three explains the methodology used in detail, comprising categories of data obtained, methods of collection, and techniques used to analyse collected data. Chapter four analyses data collected through the investigation, and presents the main findings. The fifth chapter discusses the findings holistically and coherently. Conclusions are then drawn in the last chapter (chapter six) putting forward a number of recommendations. The public service operates in a sector where competition is absent, its entities are dominated by bureaucratic ethos in which standardization and formalization have become important principles. These are not the right conditions for innovation to foster (Bekkers, Edelenbos and Steijn, 2011). Therefore, an evolutionary and incremental process to innovation is more appropriate and this is very much in line with the Agile philosophy. To set this study within a wider context the next chapter includes a review of the literature with an insight into Agile implementations within any public service entity across the globe. Additionally, an examination of operational problems the methodology tries to solve is conducted in the next chapter.